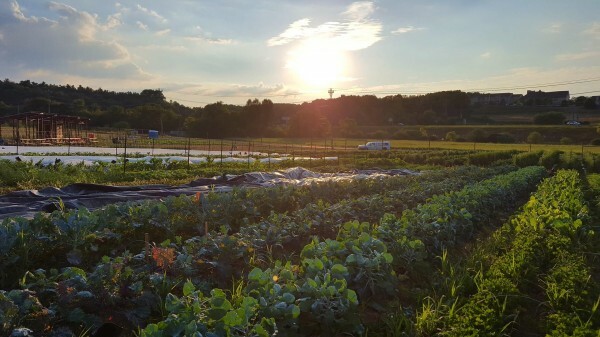 The Penn State Student Farm is quite an endeavor; we wrote about them on Local Food Journey and WPSU did a radio piece on them. Tucked away just off I-99, you’ve probably have driven right past the farm and never knew it. Well, here’s your chance to visit the farm on Wednesday, Sept. 7 for the Penn State Student Farm Harvest Festival. The event will be held at the farm from 5:30-7:30 p.m.
Editor’s Note: Local Food Journey was experiencing tech issues, but we are back after our unscheduled break. Thanks for your patience. One of Penn State’s best kept secrets is the fact that the University has a student-run farm. Located near where Fox Hollow Road runs under US 322, this summer is the first growing season for the Student Farm Club. This season marks the return of the student run farm after a few decades, as the previous student farm was transferred to a faculty-led program in 1989. The farm features tomatoes, eggplants, peppers, basil, kale, cabbage, Brussels sprouts, and broccoli.